The Middlebury Institute of International Studies at Monterey provides international professional education in areas of critical importance to a rapidly changing global community, including international policy and management, translation and interpretation, language teaching, sustainable development, and non-proliferation. We prepare students from all over the world to make a meaningful impact in their chosen fields through degree programs characterized by immersive and collaborative learning, and opportunities to acquire and apply practical professional skills. Our students are emerging leaders capable of bridging cultural, organizational, and language divides to produce sustainable, equitable solutions to a variety of global challenges. We've partnered with The Language Flagship to provide a guaranteed scholarship of $16,000 each year to its students. We recognize Language Flagship students and their commitment to language and cross-cultural communication as a valuable part of our campus community and global alumni network. You may also receive additional merit and need-based scholarships depending on the strength of your application or financial situation. Funded by the U.S. Department of State and administered by The Washington Center for Internships and Academic Seminars, the Thomas R. Pickering Fellowship Program provides undergraduate and graduate students with financial support, mentoring and professional development to prepare them academically and professionally for a career in the U.S. Department of State Foreign Service. Women, members of minority groups historically underrepresented in the Foreign Service, and students with financial need are encouraged to apply. 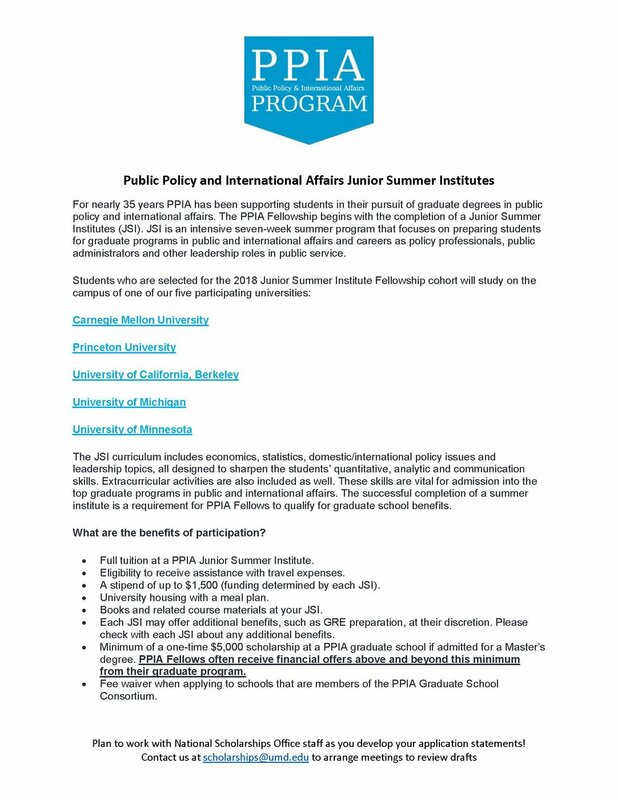 For ARHU majors interested in a career in international affairs. Point Foundation (Point) is the nation’s largest higher education scholarship-granting organization for lesbian, gay, bisexual, transgender, and queer (LGBTQ) students. Point’s multifaceted support of its scholarship recipients (“scholars”) extends far beyond direct financial contribution toward the cost of their education. Each scholar is paired with a mentor and participates in leadership development programs and events. The mission of the Fund for Education Abroad (FEA) is to provide scholarships and ongoing support to students who are underrepresented among the US study abroad population. FEA makes life-changing, international experiences accessible to all by supporting minority and first-generation college students before, during, and after they participate in education abroad programs. FEA was established as a 501(c)(3) organization in 2010 to address the need for an independent study abroad scholarship provider. Applicants from groups underrepresented in study abroad are given preference, in an effort to make the demographics of US undergraduates studying abroad reflect the rich diversity of the US population. Since 2010, FEA has awarded 167 scholarships, helping students from all over the United States follow their dreams abroad. Requirements: Enrolled as undergraduate, taking study abroad courses for credit, program is at least 4 weeks. 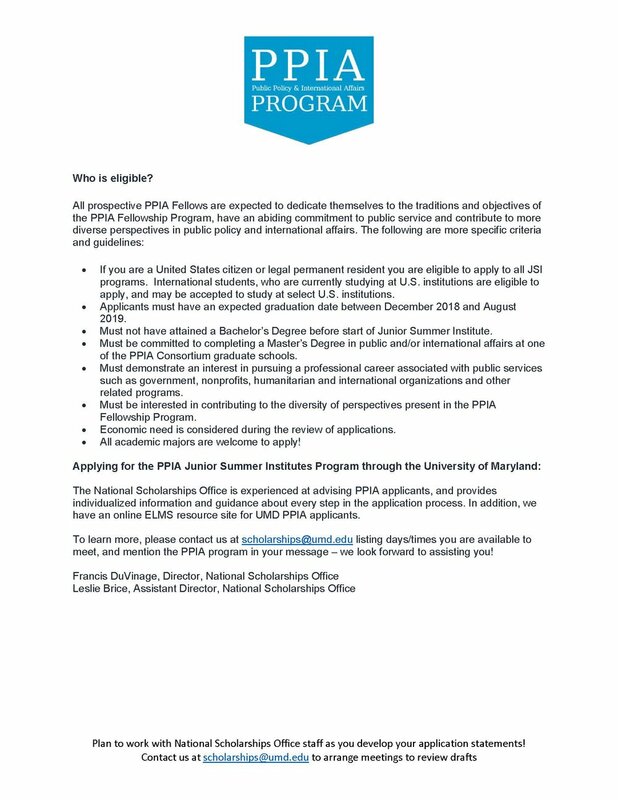 Specific scholarships also available for DC area students and LGBT+ students. These scholarships are awarded on the basis of financial need and are funded through our office and the support of generous donors, including the Kendall family and the David Family. Amount: Up to $750 for winter, spring break, and summer term programs, up to $1,500 for semester programs, and up to $2,000 for year programs. Phi Kappa Phi Study Abroad Grants are designed to help support undergraduates as they seek knowledge and experience in their academic fields by studying abroad. Seventy-five $1,000 grants are awarded each year (50 Session A / 25 Session B). Whether your Arabic is rudimentary or advanced, the CIEE Language and Culture program in Rabat will help you improve your Arabic and French, enrich your understanding of contemporary Morocco, and give you insight into the country’s role in the Arab world and Europe. Through a combination of coursework, fieldwork, homestays, community engagement, and excursions, you’ll be able to experience Morocco like no tourist can. In addition to studying Arabic, you’ll take electives in English, Arabic, or French that expand your views on the Koran, literature, politics, history, business in the Arab world, and gender dynamics, race, and ethnicity in Morocco. Guest lectures, seminars, lectures, fieldwork, and field trips are part of coursework hours. Interested and eligible students may take an internship for credit, typically with a local NGO or private institution. Learn from your host community by volunteering with a local NGO, school, or other organization. You might lead games and art or dance projects with local students, participate in a language exchange with local students, work with sub-Saharan African migrants, or shadow a doctor at a local children’s hospital. Students in the past have enjoyed working with visually impaired students, refugees, women’s groups, and children from low-income families. Musafir is a word in Arabic meaning ‘traveler’. The goal of QFI Musafir Travel Awards is to provide support for outstanding undergraduate students to further their Arabic language skills through an immersive experience in the Arab world. Through these awards, QFI seeks to provide students with the intellectual, communicative, and cultural competencies that will enable them to be engaged global citizens, able and ready to contribute to strengthening professional ties between the U.S. and Arab world. Priority will be given to students with limited experience studying abroad in the Middle East at the undergraduate level (6 months or less) and demonstrated financial need to cover the cost of study abroad. Boren Scholarships, an initiative of the National Security Education Program, provide unique funding opportunities for U.S. undergraduate students to study less commonly taught languages in world regions critical to U.S. interests, and underrepresented in study abroad, including Africa, Asia, Central and Eastern Europe, Eurasia, Latin America, and the Middle East. The countries of Western Europe, Canada, Australia, and New Zealand are excluded. Boren Scholars represent a vital pool of highly motivated individuals who wish to work in the federal national security arena. In exchange for funding, Boren Scholars commit to working in the federal government for at least one year after graduation. The Critical Language Scholarship (CLS) Program is a fully funded summer overseas language and cultural immersion program for American undergraduate and graduate students. With the goal of broadening the base of Americans studying and mastering critical languages and building relationships between the people of the United States and other countries, CLS provides opportunities to a diverse range of students from across the United States at every level of language learning. The CLS Program is a program of the U.S. Department of State. The U.S. Department of State’s Benjamin A. Gilman International Scholarship is a grant program that enables students of limited financial means to study or intern abroad, thereby gaining skills critical to our national security and economic competitiveness. The Institute of International Education has administered the program since its inception in 2001. The Fulbright U.S. Student Program offers research, study and teaching opportunities in over 140 countries to recent graduates and graduate students. A network of nearly 1,600 volunteer Fulbright Program Advisers on campuses nationwide assist in the recruitment. More than 3,600 candidates are recommended by 157 subsections of the National Screening Committee, composed of 457 senior faculty or field of study professionals. Fulbright awards are offered to students and recent graduates to pursue further research or for teaching abroad in a country where the target language is predominantly spoken.